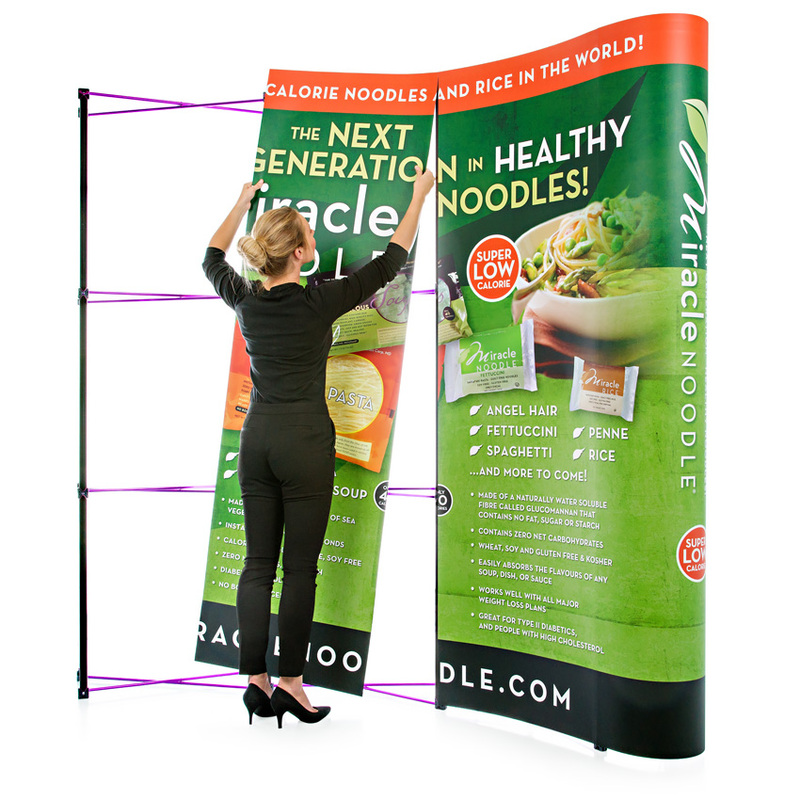 Pop up display stands are one of the best-selling, portable display solutions in the exhibition industry. Pop up displays provide a high impact exhibition back wall for a very small cost. When considering the amount some businesses spend on modular exhibition stands, pop up stands can provide an equally impressive exhibition display for under £1000. The effortless transportation, combined with a quick 10-minute setup makes the pop up an ideal display for all businesses, from start-ups at their first exhibition, to well established businesses that exhibit multiple times a year. The pop up display stand is quick and simple to set up. It can be done by one person in fewer than 10 minutes. The ‘scissored’ lattice aluminium frame extends outwards and simply ‘pops up’ in to place. Magnetic bars are attached to the frame in vertical rows; this creates the frame of the pop up display. Adding the graphics couldn’t be easier. Each panel simply hooks on to the magnetic bars at the top of the frame and the magnetic tape along the edge of the printed graphics aligns itself, keeping the graphics in place. We include printed assembly instructions with every pop up stand. We also have a useful assembly video that demonstrates how to assemble a pop up stand. To view our demonstration video, click here. All of our pop up display stands come with a Zeus wheeled transportation case. This case is large enough to store and transport the entire pop up display stand and accessories, but small enough to fit in to the boot of a car. The portability of the pop up stand is a big reason as to why it is so popular. The wheeled hard case provides protection and makes taking your exhibition kit to your venue simple and stress-free! Whether you’re putting it in the back of a car, travelling by train or using the Tube across London, the Zeus case allows you to easily transport your display without the risk of damage. Our bestselling 3x3 pop up stand is available for just £359 with the option of upgrading to the exhibitor kit for just £70 extra (this kit includes lights and case-counter conversion kit). A pop up stand comes with everything you need to begin exhibiting right away and can be used over and over again, so if you exhibit regularly a pop up is the ideal exhibition kit for you. If your marketing message changes frequently then replacing or updating the graphics is easy to do. Our replacement graphics panels start from just £68 so changing your marketing message is a cost effective alternative to replacing your complete display kit. Our pop up displays come with a 10-year guarantee and have been built to last. With prices starting from £359, it’s sure to provide you with a return on your investment. The pop up displays provides a seamless back wall for your exhibition stand. Whether you are placing your pop up display in a shell scheme, using it as a free standing display or creating an exhibition booth, a pop up stand will create a seamless graphic with a clean and professional finish. We understand that sometimes our customers need their exhibition kit faster than usual. We offer short lead times and aim to dispatch a pop up stand within 72 hours on a next day delivery courier service. However, we do offer an express service and dispatch within 48 hours – please call us on 01733 511030 for details and a quote. Our pop up displays provide a complete exhibition kit which is suitable for immediate use. The kit includes lights to illuminate your artwork, and a transportation case which allows you to store your entire kit in one safe place. It also includes a beech folding top and a graphic wrap which convert the case into a portable meet and greet counter. This exhibition kit is perfect if you have a typical shell scheme or space only area. 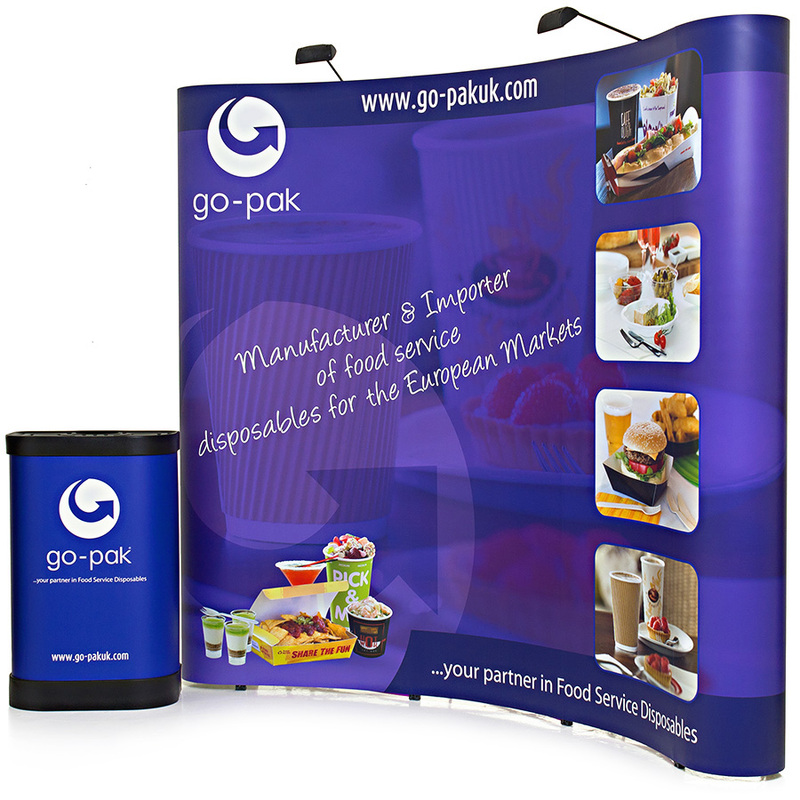 Our pop up displays are available in a range of sizes and styles to suit any exhibition requirement. The standard pop up is available in five sizes – 3x1, 3x2, 3x3, 3x4 and 3x5. You can choose from a straight or curved shape depending on your stand shape. Double sided options are also available to ensure your brand is seen from all angles. A typical 3x3 Pop Up stand is 3 sections high and 3 sections wide. Our standard 3 section high pop ups are 2.2m high and widths vary depending the size that you choose. We also offer Midi pop ups displays which are slightly smaller in height and stand at 1.8m high, ideal for exhibition spaces where height is restricted. Our jumbo pop ups stand at an impressive 3m high, perfect for making sure your display doesn’t get missed. If you require a Jumbo or a Midi pop up display, please call us for a quotation on 01733 511030. Add a monitor bracket which allows you to attach a TV or monitor directly to the pop up frame. Ideal for playing a show reel or presentation. Our XL 60 Free Standing TV Stand can be integrated behind the graphics of your pop up or it can be used as a separate TV stand elsewhere on your exhibition stand. The Mobile TV and Monitor Stand on Wheels and the Portable TV Stand, which are both portable stands on castor wheels, can also be used to enhance your exhibition stand. The pop up counter works in a very similar way to the pop up display. It features a pop up frame, wrap-around graphic and a counter top. It creates a meet and greet counter or reception area for your exhibition stand. For more information on our pop up displays stands or our accessories contact us or call us on 01733 511030. 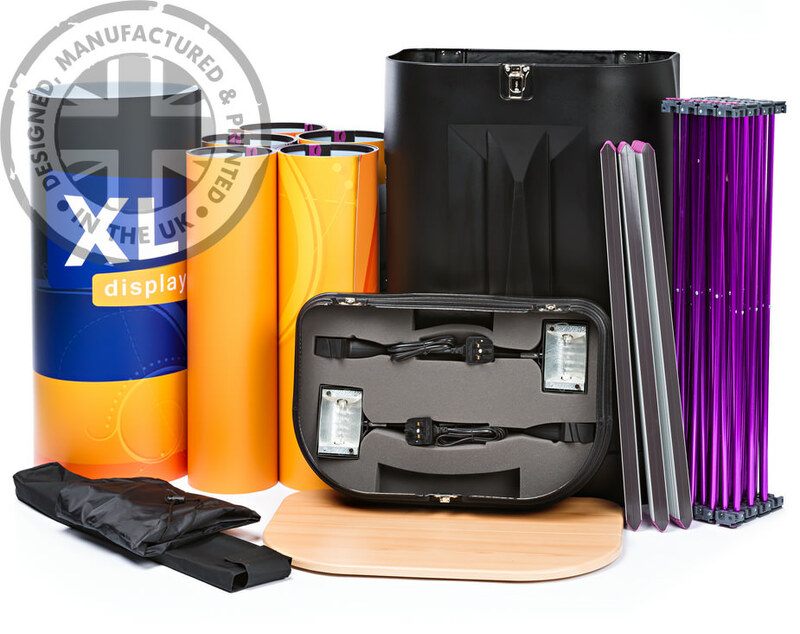 At XL Displays we are experts in portable exhibition displays and bespoke exhibition stands.